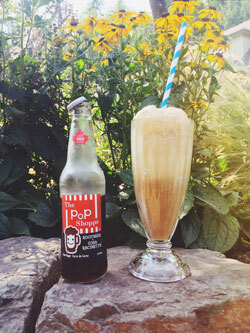 What better way to launch into August than with the introduction of POP SHOPPE vintage Ice Cream Floats! Pop Shoppe soda is an iconic Canadian brand that started up in Ontario in 1969. Now owned by Ontario's Beverage World, the vintage stubby glass bottles and traditional soda flavours are a fun addtion to the Ruddy's cold drinks lineup. Pour it over creamy organic vanilla bean ice cream, in an old fashioned milkshake glass with a paper straw...well, what could be better on a hot afternoon?